After the disaster of the falafel (and I still can’t figure out what went wrong) I went back to a basic, if very odd dish – watermelon salad. Val introduced me to this odd concept dish a year or two ago and initially I was reluctant to taste the combination of watermelon and feta. I got over it and am very glad I did as it is a great, if odd, dish. After pondering which version to go with (there are a lot of variations out there) I went with a classic Greek variation. 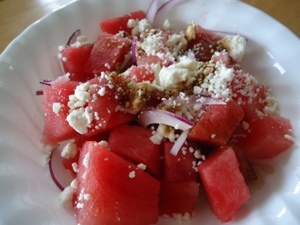 Watermelon, feta, red onion and aged balsamic vinegar. That’s it, the whole entire dish. Four ingredients. 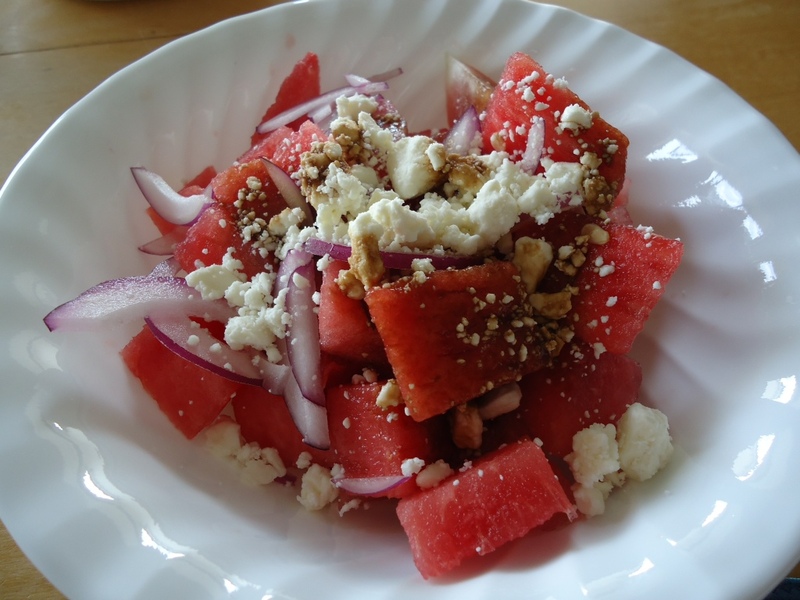 The watermelon was sweet and made a nice contrast to the salty feta while the red onion provided a tang and crunch that was more substantial than the watermelon crunch. I liked the balsamic addition; I can’t tell you exactly what it added, but it did add something that I did not have with the other versions I’ve tried. It was nice to have a successful dish after the falafel incident. I paired this with a simple sautéed chicken breast for a grain free meal. I will say, I am looking forward to Bob’s geek weekend so I can have the gain filled vegetarian meals I miss. I may even make waffles. That is, of course, assuming I can get over this cold and have the energy and taste buds to cook and appreciate what I cook. If I don’t post before Friday, I hope everyone has a great long Labor Day weekend. I was all excited today. 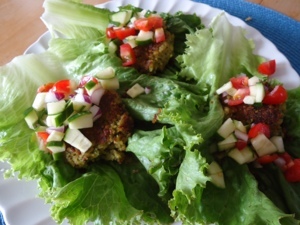 I was trying to figure out an interesting meat free, grain free meal and remembered falafel. Bob and I both really like falafel so, as I had the day off due to the “storm” I headed to the grocery and got what I needed – chick peas, parsley, etc. Picked up a few things for the week too then headed home to start the falafel. They came out beautifully. 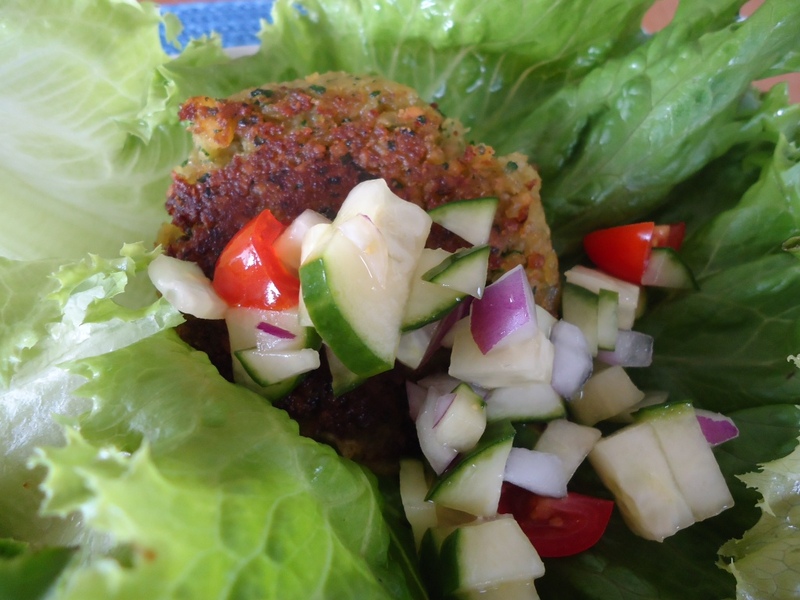 The looked perfect; they did not fall apart in the frying pan and in place of pita bread I used lettuce. Oh, they looked great. But what the picture does not tell you is that we just could not eat them. Bob and I dug in, very excited, and discovered something was wrong. They had an odd texture, but also a chemically, soapy taste. About two bites in and we determined, for the first time ever, that dinner was just totally not edible. That’s right, for some reason, this time the falafel, as pretty as they are, just could not be eaten. The strange thing is, I have made these before. I’ve tried several versions, including this one, with great success. Although I will admit to getting them to stay in a patty shape has been difficult. But today, for some reason, they did not work. I’m not sure if it was the chick peas, the parsley, the onion, the baking soda, or something else entirely. As a little kid, we use to sit around the radio on on early winter mornings waiting to hear our school number – that magic number that said school was closed that day. Snow days were (to us kids) a joy – an unexpected day off. Florida does not get snow days and I’ll take that as it means no snow. But we do, apparently get hurricane days. Since the advent of the internet and real time everything, the decisions to close schools are made earlier. I know the schools are used as shelters, and with busses running and kids standing outside waiting for said busses, no one wants to say hold school when there is a real possibility of severe weather. So … Saturday (after getting the call that there would be no school Monday due to weather) and early Sunday we prepped, like good Floridians, for a possible storm. I took in the pots, moved all potential flying objects indoors and made sure we were ready. I didn’t go the the grocery store – can’t stand the crowds and really, do I want a fridge full of food if the electricity goes out? (I still have vivid memories of the eight days without power with Opal. I thought we did a pretty good job. 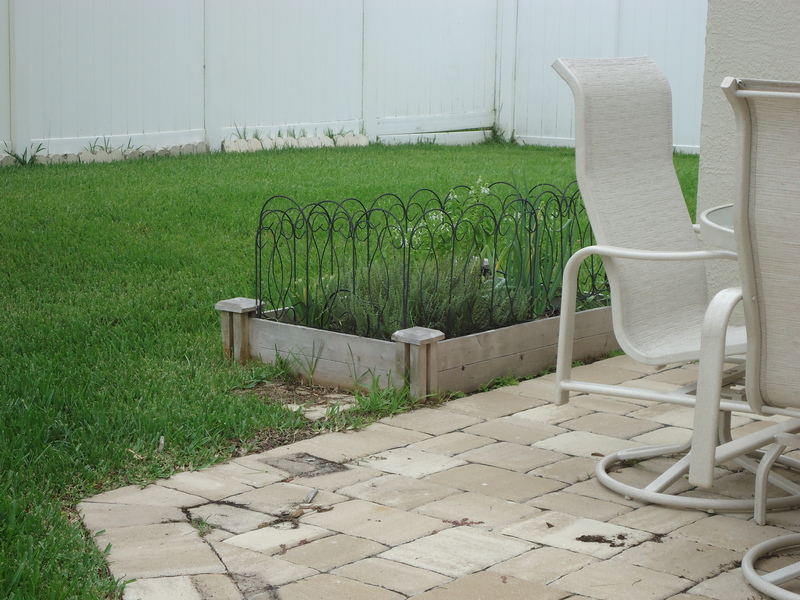 And, yes, I knew it was probably overkill and unnecessary, but I am a bit paranoid that if I did nothing, we would get the direct hit (even though Sarasota has apparently never had a direct hit) and if I prepped, we would get nothing. Looks like the prep won. This storm does remind me of Gloria from the mid 1980s. We had a day off school for the hurricane (yes, even in Jersey) and I don’t remember too much to it. I do remember playing outside in the wind and a little rain and the song Gloria on the radio over, and over, and over. Now, Opal, Floyd and Florence, I remember a bad storms that did a lot of damage. But Isaac seems more in line with Gloria for me. Now when it makes landfall … we’ll see. So far we have had some wind, some rain and not much else. Even little miss Leia went out this morning and is going in and out as is her usual plan when the back door is open. 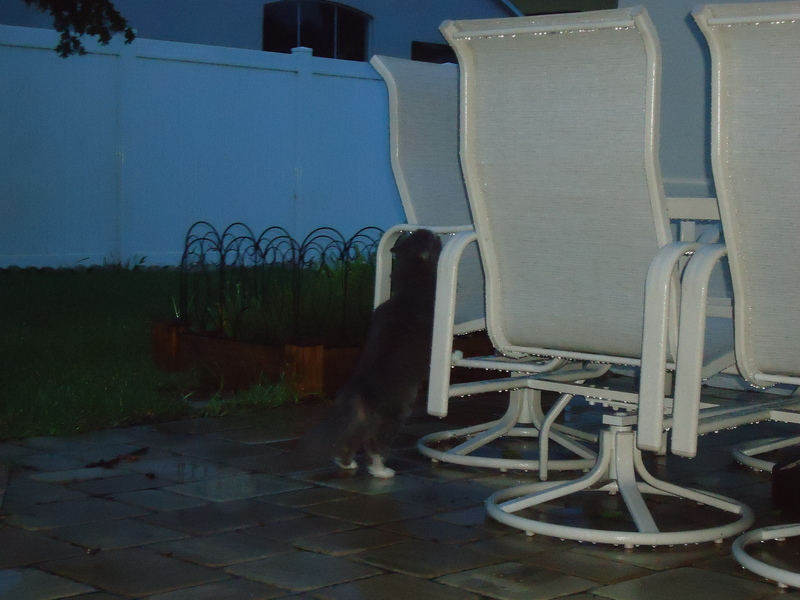 If you can make it out, that is Leia drinking water from the chair outside early this morning. She spend a good while exploring in the rain before coming in to demand kitty crack (aka hairball paste). Gracie, as seen in the top picture, was not as enamored with the weather and did not venture forth. Poor thing has gotten caught in a few too many rainstorms. But at least she is not under the bed this morning, which is where I expected her. 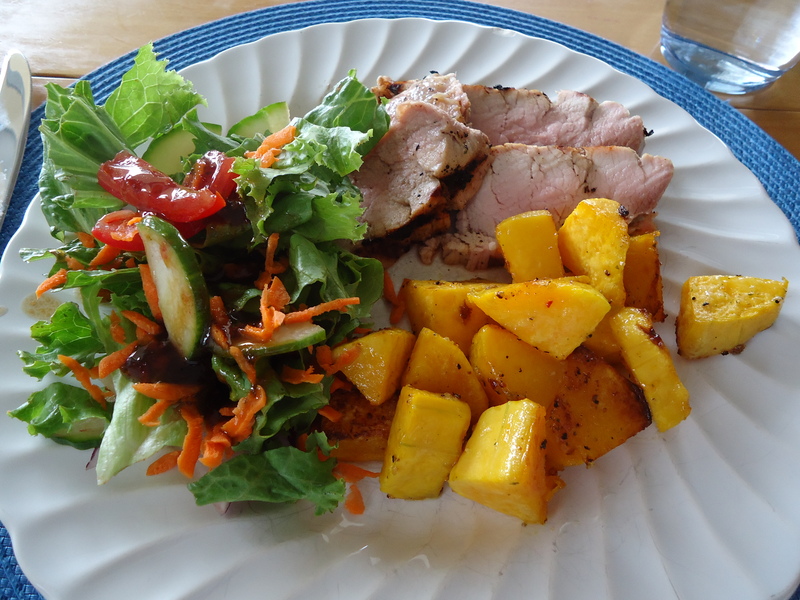 On to food … I did not do anything too exciting this weekend, but the pork loin with butternut squash and salad did come out rather pretty. I still have to look through my cookbooks today and plan something for this week. Not sure what I am in the mood for (other than spaghetti and meatballs which given Bob’s no grain stance isn’t happening) but I am sure I will come up with something – after all I have an unexpected day off to plan. Hope everyone is well and safe! I got my first Friday working from home yesterday and while I was a bit apprehensive on Thursday as I saw the mounting piles of work, by 11 am on Friday I was so happy. It is amazing what one can get done when no one is around to ask questions, or break the flow of work. I could say interrupt and that would be accurate, but I like most of the interruptions at work since they come from the kids. But working from home I not only managed to get a ton of work done, I also managed about eight loads of laundry and made ribs. I should have taken a picture of the plate of ribs alone, but I forgot. 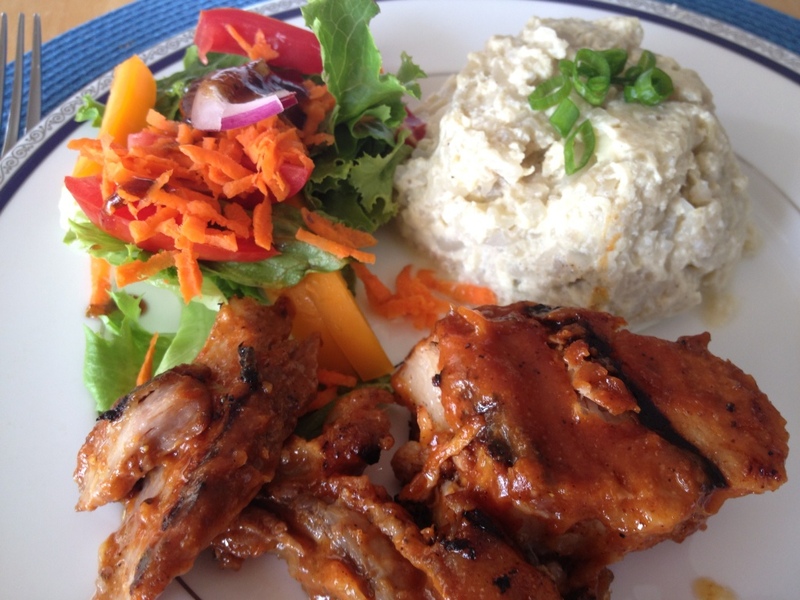 Mom and dad came over for dinner, and the ribs went over well. I did make a vegetable timbal again – this one with eggplant and turnip as that is what I had on hand. It was ok, but I liked the squash one so much better. The salad came from my veggie basket this week. Lettuce, tomatoes, carrots (those were last week but it still counts) cucumber, and some orange pepper. It was a pretty little plate overall. 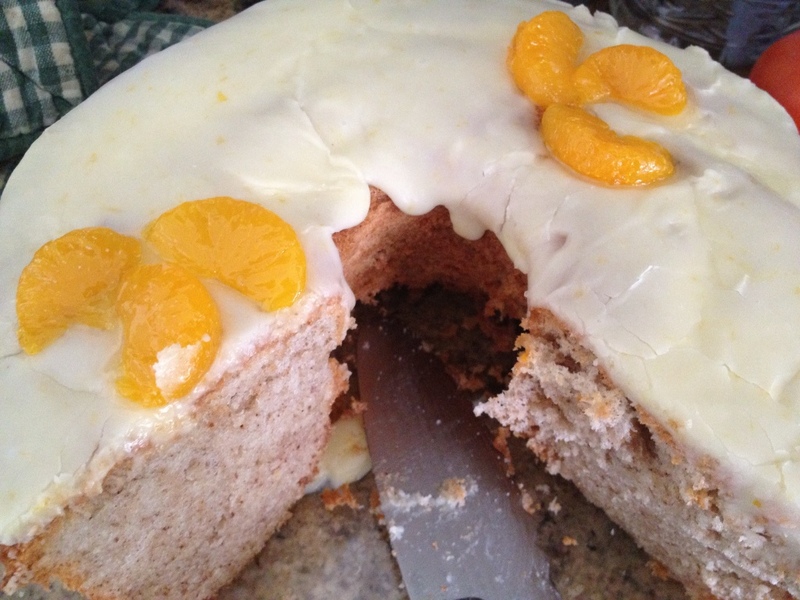 Mom brought dessert – a spice chiffon cake with an orange glaze. It was so very good, even Bob had two slices. The texture was just like grandmom’s chiffon cake and made me want to bake one of hers. Coffee flavor in cake cannot be wrong. Now if I can only dig out the recipe I may do that when Bob heads off for his geek weekend in a few weeks. We forgot to take a picture of the cake prior to cutting it. But I still think it looks pretty good; it tasted better. The old, orange cover Betty Crocker cookbook wins again! The kids are back in school this week which oddly means I am not as busy as the prior two weeks. Don’t get me wrong – I got out of work on time once this week, but at least my late days were reasonable late and not twelve to thirteen hours after I got there. As I sit here and write this Bob is doing some crazy rap thing for his work. I’m not sure what, and I’m not sure I want to know, but it just reminds me of the question Laura posed at the wedding … “Did you ever think you would marry a man who knows every word to the Humpty song?” No. Just a simple no. I’m not sure why I remember that question so well, but it may have something to do with the picture of Bob dancing and rapping in a suit as my mother danced along. Not something I am very likely to forget for a very, very long time. But on to the important stuff … Food. This week was not exactly conducive to culinary master pieces that were photo worthy. Long days and falling asleep on the couch by nine don’t make for exciting dinner options. However, I did manage one very tasty photo worthy meal this week. Dandelion and spinach salad with goat cheese and tomato dressing. I must admit I was skeptical about this one. Dandelion greens are usually way too bitter for me, cheese based dressings are like cream based dressings and not my thing and spinach is very hit or miss for me. I was so pleasantly shocked at how good this turned out. I would have happily eaten it for the meal itself. 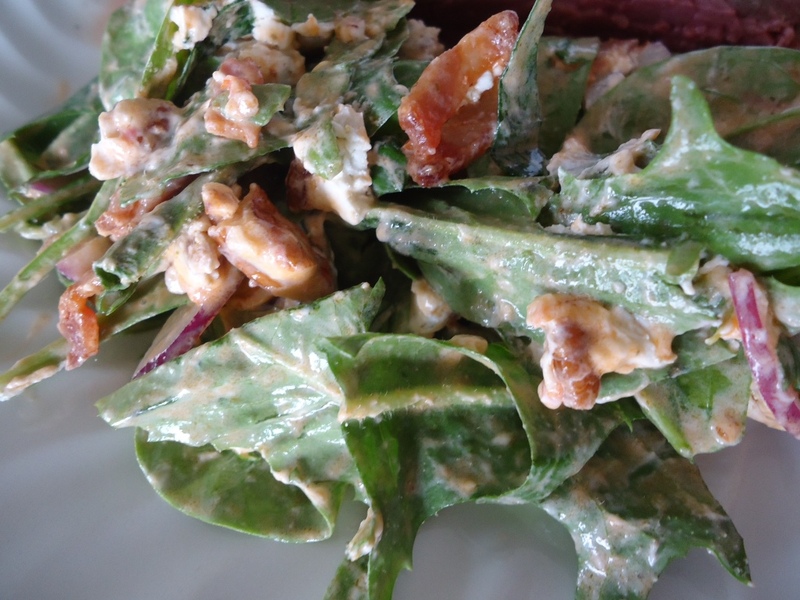 The salad was basic – dandelion greens, spinach, red onion, pecans and bacon. The dressing took goat cheese, white balsamic vinegar, olive oil and one plum tomato in a food processor. Pulse until it is all combined and liberally dress the green mixture. Had I known how much I would have liked it, it would have been dinner alone. 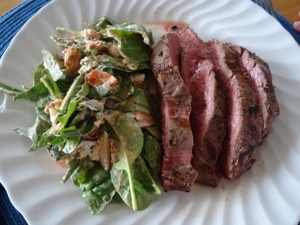 I could have easily eliminated the bacon for a great vegetarian, grainless meal, but alas, I did not know so I paired it with a grilled flank steak. This was such a great meal. I did not get bitter from the greens, the cheese gave it a lovely texture and heartiness and the red onion and pecans a crunch that was needed. It does not, however, save well. I tried to take the remains to work for lunch and wow was it bad. So this is not a make ahead recipe. But now I know and I can take the dressing and salad separately. Tomorrow is ribs, so I should be able to get a picture of those. Hopefully. 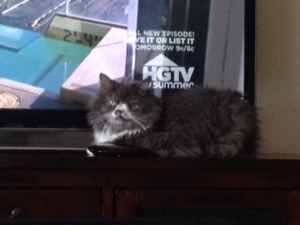 This came about because a few mons ago Bob asked how I felt about a new television. The one we had was mine from Jersey and while an HD set, it was an early generation HD and apparently not the “latest” or “best” thing out there. For the little television we watch, I thought it was fine, but he started getting the itch for a particular television. I told him he could do whatever he wanted, so long as I didn’t have to do anything. Not get rid of the old cabinet or television, not move furniture, not talk to any salesmen about televisions, etc. if he wanted a new set up, he could do it. And he did. 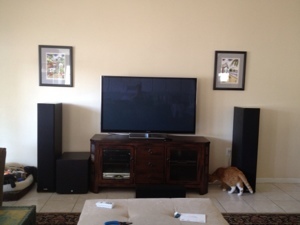 I somehow didn’t imagine the size he would pick out, or the plethora of speakers (which apparently you have to put in certain spots and really can’t arrange based on how they look in the room) but he did it on his own, and I just came home to it all working. Now if I can only figure out how. Leia does like the new console. She also likes one of the speakers, but so far she has managed to move before I can get the camera. I will need to some rearranging/redecorating but that can be done over time. Multiple twelve plus hour days in a row does not lead to many home cooked meals. Bob had to fend for himself this week, but I did manage to pick up my veggie basket on Friday – eggplant, dandelion greens, green pepper and Roma tomatoes. I think I can make some great dishes with those provided the first week of school for the kids goes basically according to plan. As I mentioned in the last post, I found a way to make kale that Bob and I not only don’t mind eating, we actually really like. 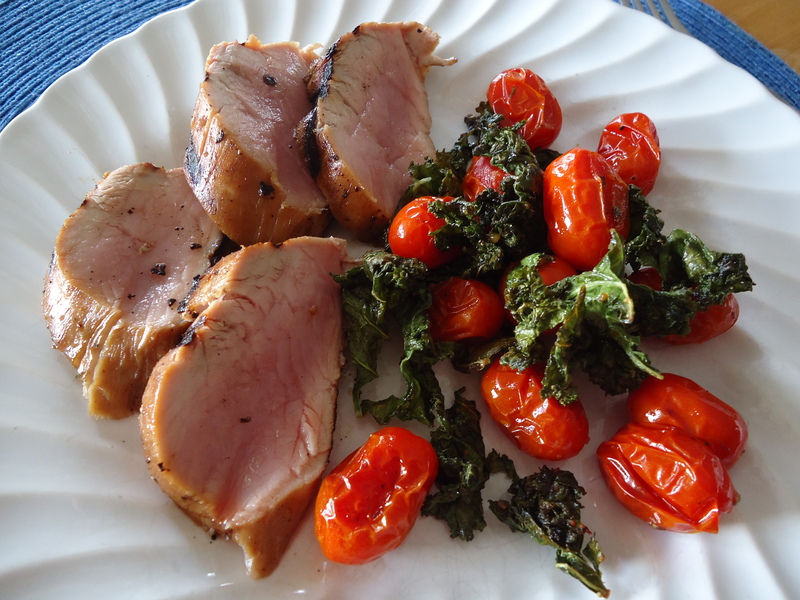 I adapted the recipe (of course) from a roasted tomato recipe I found on line. And by adapted I mean looked at, took the basic idea, then totally changed it. I made this the other day in the oven, but as I was grilling pork loin today, I went with the grill. for a very nice little dinner. In all honesty I could do the kale and tomatoes by themselves as a great vegetarian dinner, but alas, I do not cook only for myself. I should also mention this is a quick dinner – I made the entire thing after work and we still managed to eat before I was starving and biting Bob’s head off. So this can be added to the weeknight meal rotation (as long as I have kale in my veggie basket >-<).